On October, all the teachers met in France to prepare our two years long work. The French team gave us a great welcome. Thanks to all of them. we prepared the first comic about "My school"
Through the creation of the English comic: “An English European comics”, the children will discover their Europeans partners and exchange informations about culture, art and new technologies. 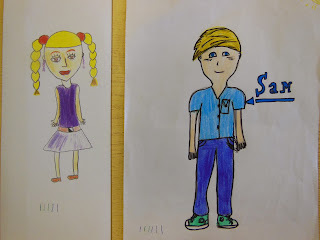 At the beginning, all along the first month, each school will create two characters: a girl and a boy. In the first meeting, we will vote for a girl and a boy drawing. They will be the thread and will appear in every story created by the children. It could be the logo of our project. After that, each child will present himself in a comic strip of three cases : I am, I have, I like. All along the two years of the project, children from each country will create comics strips telling the story of these two kids. We will plan 6 steps. During each step, children will create a story made of two or three strips and talk about a different topic: my school, my country, national sport, folklore, history and gastronomy. Each one will use the comics way/style they want and would be able to switch their style/way (drawing, picture, paint,...) for each topic. The entire comics will be written in English, which will be the lingua franca. Everyone will send by mail their creations to the other partners. This will allow to everyone to compare the other works, to comment them through the website and improve the next creations. At the end of the two years, we will gather the creations of all the partners in order to make a printer or electronic book. We are seven European partners from Poland, Sweden, France, United Kingdom, Croatia, Czech Republic and Belgium. On September, we will start working together during 2 years about Comics. We are looking forward to start the project!! !